You may have heard this reflection before: that stocks are so integral to cooking, the French use the word fond, meaning “foundation,” for most stocks used in the kitchen. Fond de veau (veal), fond de volaille (poultry), fond de boeuf (beef). They’re the base for countless recipes, including soups, stews, sauces and that old-school showpiece, the aspic (or, more elegantly, gelée in French). Which explains why various stocks were among the first things we were taught to perfect in the program I went through at La Varenne cooking school. Fish stock is no less a foundational recipe, though it does get tagged with a different name in French cuisine: fumet rather than fond. It translates as aroma, I like to think if it as essence. 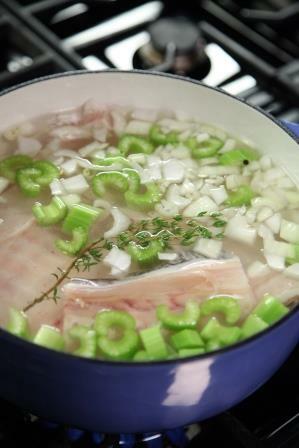 Though the general principle of making fish stock is the same as that for the meat stocks, fish stock is inherently lighter in character and quicker in preparation. Not only because it takes less time to draw of a maximum of flavor from more delicate fish bones than heavier beef bones, in fact too much cooking will bring a bitter taste to the stock from the bones, for funkier-than-intended results. Twenty minutes is plenty. For a class I recently put together for Craftsy featuring core, essential techniques use in French home cooking, it’s little surprise that stock was on the agenda. One lesson is for a rustic fish chowder, for which using a homemade fish stock adds great flavor and character to the pot. I didn’t want to presume that folks approaching French cooking for perhaps the first time would be willing to sign on for the 4 to 5 hours or more needed for beef stock. Fish stock makes for a great entry-level version! I’ve found lately that the biggest trick for making fish stock is coming up with the fish bones to toss in the pot. Fewer and fewer groceries get fish on the bone, which limits the bones and trim they’ll have on hand after filleting or portioning fish. Call around to fish markets or upscale groceries near you to see if they’ve got bones on hand. You might need to make an advance request, so it pays to plan ahead a bit. Or, if you buy or catch whole fish and fillet it yourself, you should keep the bones for using in stock (if not right away, the bones can be frozen for a month or two before making the stock). The fish to shoot for are of mild types, for results that will be the most versatile. Halibut is among my favorites, other flatfish like sole and flounder great too. Rockfish, snapper, cod work well. Generally it’s best to avoid boldly flavored fish such as black cod or salmon. The exception being when you’ll be using the stock in a recipe featuring the same fish. In that case, for a salmon chowder as an example, it would be a perfect time to use salmon stock. There’s no salt in this recipe, which isn’t an oversight. True for all stocks, it’s good practice to not add salt to the stock itself, instead adjust seasoning as needed in the context of whatever recipe the stock eventually contributes to. There are some occasions when a stock may be boiled to reduce, to thicken and/or intensify its flavor a bit. If the stock were salted in advance, that reduction could leave you with a powerfully salty flavor. So just avoid that problem by not grabbing that pinch of salt until using the stock in a recipe. Extra stock can be frozen to use in other recipes; it’s not a bad idea to go ahead and double the recipe and stock up! I freeze some stock in premeasured quart quantities. The rest I freeze in ice cube trays and later put the cubes in a heavy-duty, resealable plastic bag. That way, I’m able to use just the amount needed for a recipe (check the volume of 1 cube section in your tray; my trays make cubes of about 2 tablespoons each). Take the pot from the heat and let the stock cool slightly. Slowly pour the stock through a fine sieve lined with dampened cheesecloth into a large bowl. Let sit until fully cooled. When using the stock, pour it gently from the bowl, leaving behind any fine solids that will have settled to the bottom of the bowl. Good, real stock makes such a difference. And for fumet that is even more true. I made Sole Normande last week with sole fumet. I always put a little white wine in my fumet (wasn’t that a Chambrette trick?). Then I strained the fumet and used it to poach the garnishes of shrimp, razor clams and mussels. The reduction, with cream, was amazing on the braised stuffed sole. I also have lobster stock and lobster butter waiting for the holidays. Do you have some fun recipes for us to use the stock? Thanks for this great idea ! Can seafood bits be used the same way ? What do you think about using crab, shrimp or lobster bones / shells in an all purpose stock , v.s. Limiting their use to recipes with that seafood as the ingredient ( like your salmon example ) . Or is a seafood stock not at all like a fish stock ? Absolutely, Cate, shellfish shells are great candidates for a quick stock as well. In fact, they often have enough flavor that you can simply simmer them with water for 15 to 20 minutes with flavorful results, though adding the aromatics and vegetables a delicious way to go. For one of my cookbooks I made a crab stock having roasted the crab shells first, then adding the carrots/onion/celery plus fresh ginger and lemongrass. There are lots of options in the seafood arena!